There is something in our environment wreaking havoc on our sleep schedules, causing damage to our eyes, and affecting our vision, yet many people don’t even realize they are exposed to it several times per day. The culprit is blue light. It is emitted from our smartphones, television screens, computer displays, and artificial lighting. You can now detect and block blue light. Light is essentially electromagnetic particles that form waves. These waves travel through the air, creating different colors and producing varying amounts of energy. The smaller the wave, the more energy it gives off. Together, the different wavelengths create the light spectrum, and at the end of the visible light spectrum is blue light—one of the highest-energy, shortest wavelengths created. It is emitted by both natural and artificial light sources, such as the sun, electronics, and LED lighting. Not only that, but if blue light is taken in right before you are supposed to be sleeping, it can throw your entire circadian rhythm off track, making it difficult for you to get the quality of sleep you need to be at your best. While our eyes do naturally offer some protection against blue light, it is simply not enough to eliminate all of the harmful blue light exposure most people come into contact with throughout their day. Luckily, a blue light filter lens coating is now available for most prescription eyeglasses. This coating causes the harmful blue light rays to reflect away from the wearer, while still allowing the beneficial blue light rays to get through. By eliminating the blue light exposure, eye damage and fatigue can be greatly reduced. Additionally, studies show that people who wore blue light blocking eyeglasses had a marked improvement in their sleep quality. With our Huvitz Auto Lensmeter HLM-9000, upselling your patients on the blue light filter lens coating has never been easier. 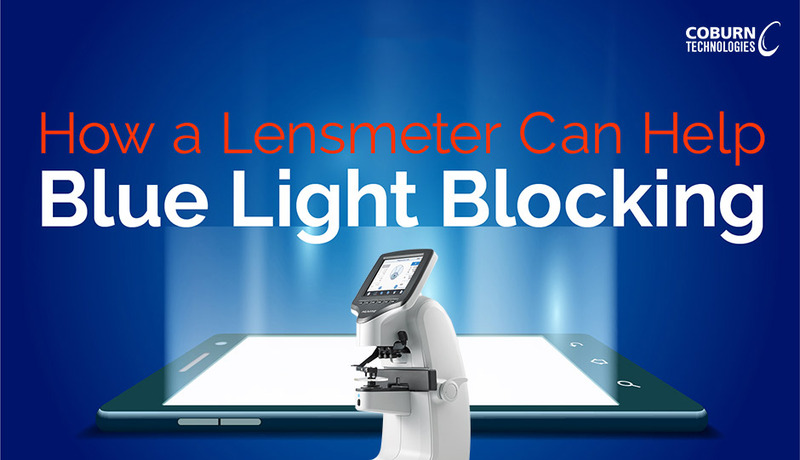 In addition to measuring the complete prescription on the lenses, this advanced lensmeter features a one-of-a-kind technology that actually measures how many harmful blue light rays are making their way through the lenses—and you can show them the results both with and without the coating. Once you quickly print out the results, your patients will see the benefits of the additional blue light filter lens coating in black and white, and they will have a hard time saying no.